Saturday, 19th of May, 2018 marked the wedding date of the traditions defying couple, Prince Henry, Duke of Sussex and Rachel Meghan Markle, Duchess of Sussex, once again proving that love wins no matter the odds. 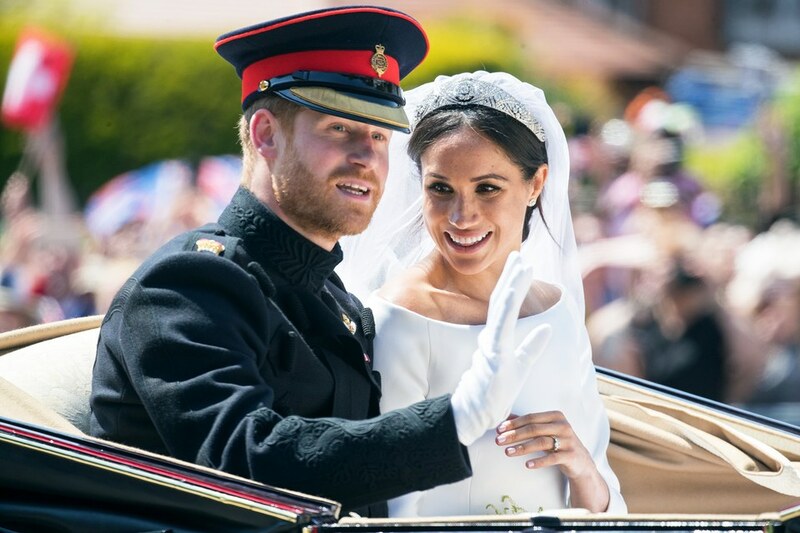 The iconic day was filled with fancy decorations, lots of cake, upbeat music, royal members and the couple's A-list celebrity friends along with adorable bridesmaids and page-boys with 18 million Britons and 2 billion people worldwide tuning in to witness the most-awaited day of the year. 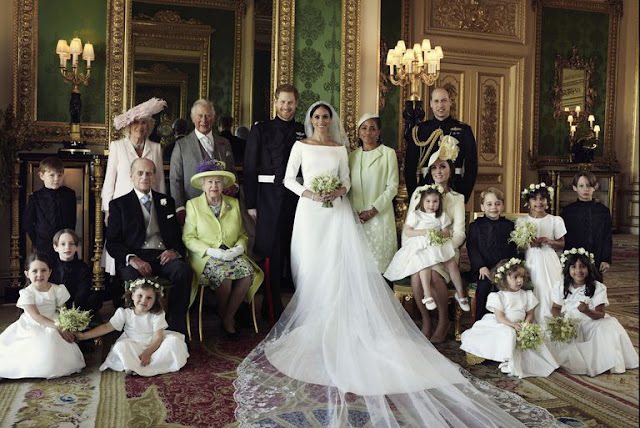 In addition, the Royal family hosted 2,640 members of the public and about 600 others, everyone expected to put their best foot forward in terms of glamour and style. Keeping our eyes glued to our mobile screens for any photos or videos for who wore what, best dressed, worst dressed, and the brands most worn on the day, hitting refresh on our Instagram feed receiving little to no information and stale photos; not to mention the waste of time and missing out on the style choices of the gorgeous ladies. Listed below is the mix of 10 Royal and A-list women celebrities in their gorgeous attires, with details about the brands, make-up and how they are related to the newly-weds. Grab yourselves a cup of coffee and some snacks to enjoy this relaxing read. The Queen has always been a style icon for Britons and fashion lovers around the globe. Her bright colored outfits and glamorous hats make her stand out and easily noticeable to the public. Being the grandmother of prince harry along with the head of state, she chose to wear a lime green flared dress by Stuart Parvin and a similar toned hat decorated with handmade lace crystals; by Angela Kelly and Lucy Price. The well put together an outfit does not steal 'Rachel's Thunder' and at the same time makes the Queen look unique. Camilla, the step-mother of Prince Harry and now, mother-in-law of Meghan Markle went for a pale pink color and an elaborate hat. She wore an asymmetrical pink colored dress coat by the designer Anna Valentine and a similar colored feathery hat by Philip Treacy. The choice of color seemed to be the most appropriate given the romantic occasion and the spring-meets-summer vibe. She topped it up with the 5 layered pearl necklace and a clutch. Being one of the most loved British women for her sense of style and generosity, Kate very well understated herself for the wedding going for her trustworthy choice - Alexander McQueen; yellow coat-dress, a floral hat by Philip Treacy and heels by Jimmy Choo. She very smartly made fashion choices which kept her safe from any scrutiny whilst keeping the limelight on the bride herself. 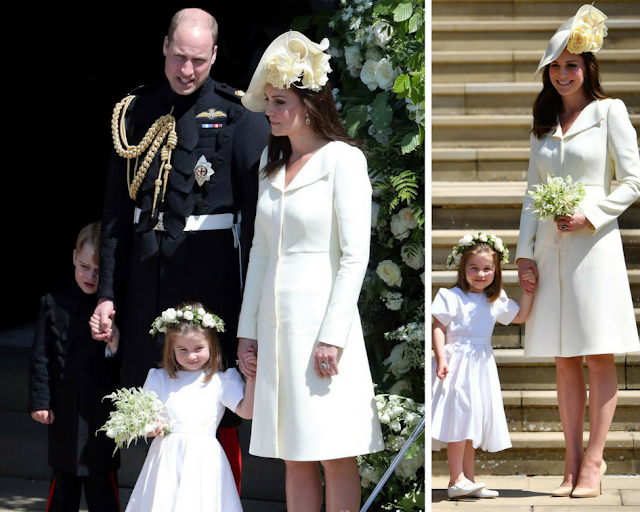 The 29 years old princess has broken many a royal dressing protocol in the past, one of the most prominent being her 'way-too-big' of a hat at Prince William and Kate Middleton's wedding at 2011. However, this time she played safe at cousin Harry's wedding by wearing a Roskanda Viola dress in the shade Turquoise studded with several beads and translucent long fluffy sleeves pairing it up with a headpiece by Stephen Jones and heels. The over-all outfit made her look feminine and fresh due to her color choices. 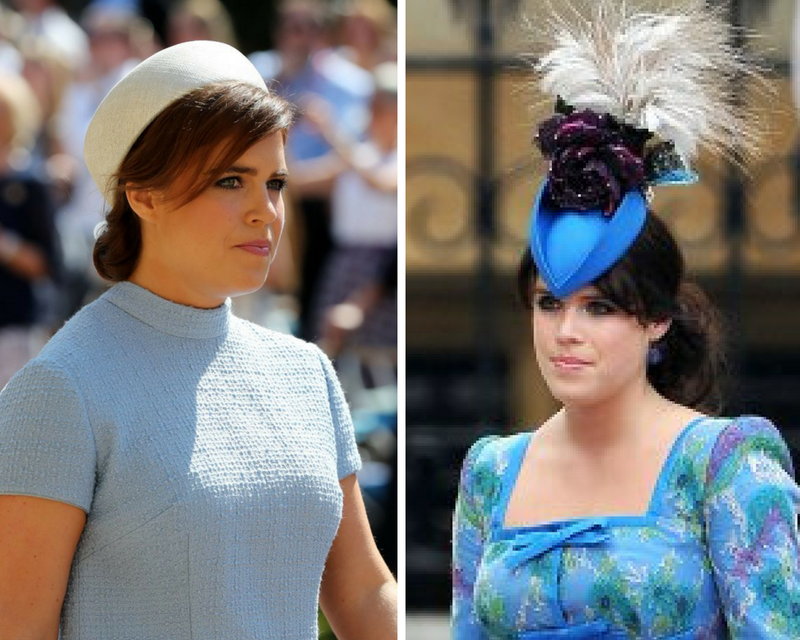 On the other hand, Princess Eugenie went for a muted color, powder blue along with a matching pillbox hat and silver Valentino shoes and beige colored handbag. Both the sisters playing it safe unlike their previous public appearances as it was a big "no-no" to steal the spotlight from the newly-weds in the royal household. 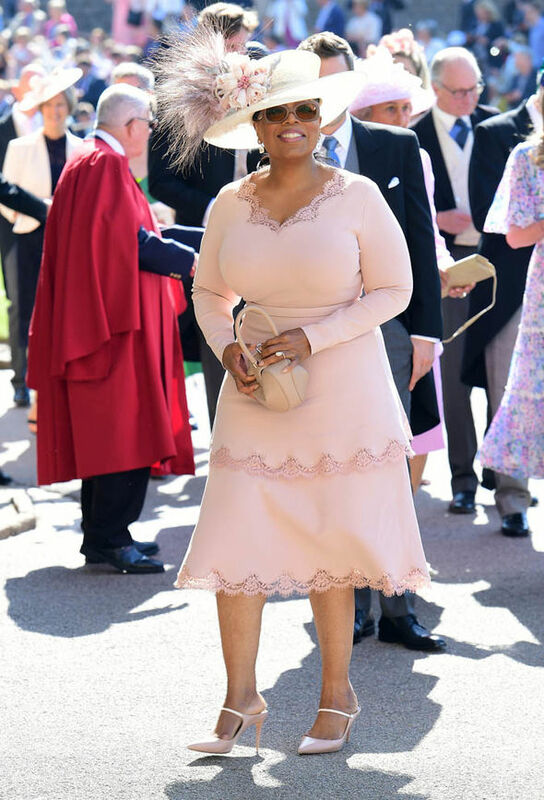 The American Media Propetior, Oprah Winfrey was on the guest list amongst many others for the Royal Wedding. On the day before the wedding she posted a video on social media admitting her outfit mishap, the former dress being too white which underwent a last-minute change with her showing up in a two-tier dress with lace borders by Stella McCartney, a dramatic Philip Treacy hat which underwent a make-over by adding new feathers, clutch, and same colored stilettos. The 44-year-old fashion designer Victoria Beckham looked poise, chic and feminine wearing a midi-dress in the color navy blue with bright orange colored stilettos and a fascinator. The dress belonged to her own label looking quite similar to the one she wore previously on William and Kate's wedding in 2011. The dark color of the dress did make her look elegant however, it’s a questionable choice given the wedding was held in spring-summer season and the occasion to be a romantic one. A lighter color palette for her dress and/or floral patterns would be a better choice for the event. 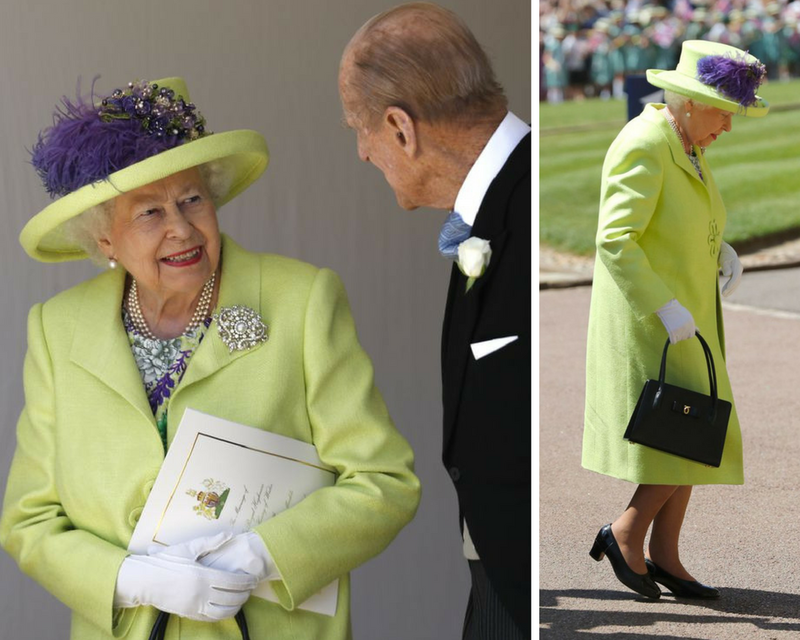 Nevertheless, her color choice complimented her husband's attire and both looked great together. The tennis star and Duchess of Sussex first met at the Direct TV's Celebrity Beach Bowl and their friendship blossomed each time Meghan cheered, congratulated Serena for her back to back tennis wins. 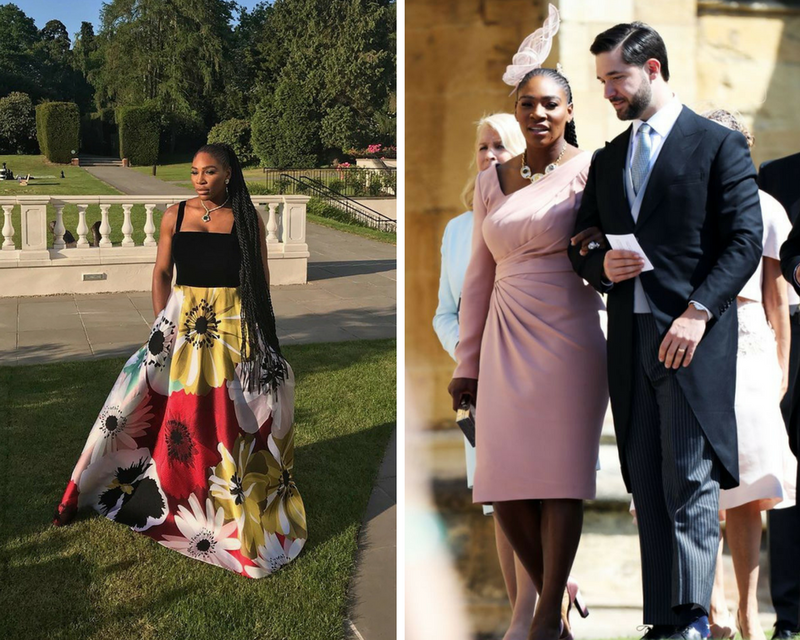 Now, it was time for Serena to support Meghan at her wedding. The gorgeous athlete wore a pink dress by Versace matching stilettos and a gorgeous fascinator which if I am not wrong, made her look like a magical unicorn for the wedding ceremony. Adding details to her outfit was her all-time-famous small braids pulled into an infinite looking long ponytail of rope twists and minimalist accessories to adorn her hands and a neckpiece. 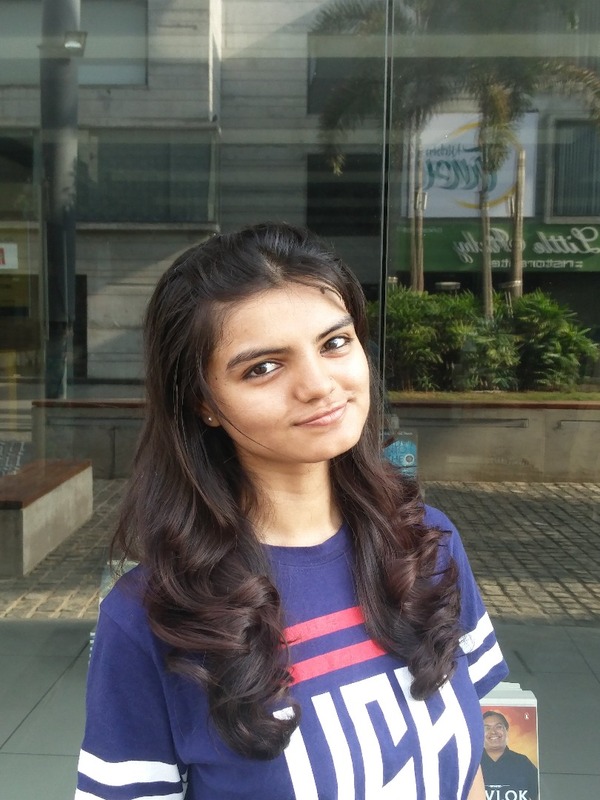 For the night time events, she shifted a floral gown with sneakers leaving everyone in an awe. Ever since their meeting; the Bollywood diva, Priyanka Chopra, and Meghan Markle at the annual ELLE women in television dinner they have hit it off quite well; supporting each other time and again. PC attending the royal wedding was inevitable. The former miss world slayed both her morning wedding ceremony look and the evening reception look. 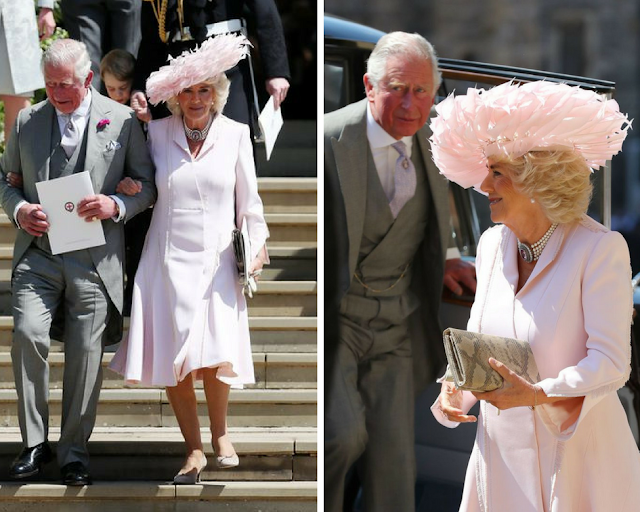 For the wedding, she wore a lavender Vivienne Westwood suit and topped it up with Philip Treacy hat along with a clutch and gorgeous pair of lavender stilettos. For the evening reception, she underwent a complete makeover with a sparkling Dior full-length gown, diamond studded earrings, and a silver purse. The actress turned heads at every step. 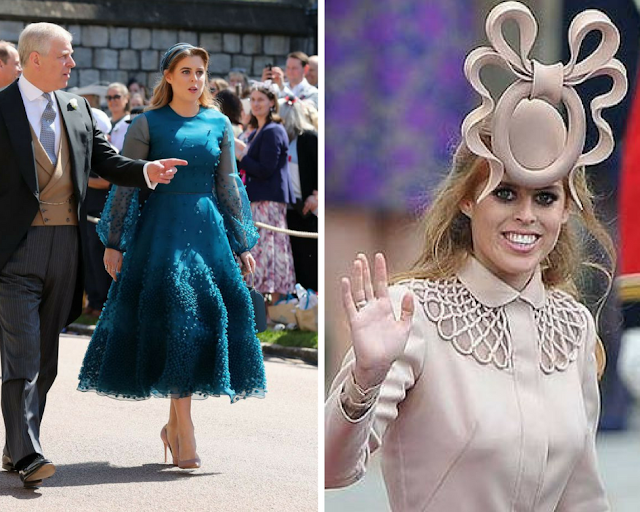 All the ladies followed the royal dressing etiquettes by upholding a tradition of wearing outfits designed by British fashion houses like Vivienne Westwood, Stella Macartney, and Alexander McQueen whilst being effortlessly stylish. On the other hand, Philips Treacy ruled the hats and fascinators section. No matter the fashion choices, all the ladies looked their absolute best at the event making it hard to choose a favorite or 'best-dressed'. 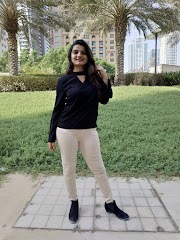 Comment below your thoughts about the Royal Wedding and Subscribe to the blog to get notified on all of my future posts. Disclaimer: None of the images used in this blog belong to me. They are used to showcase the outfits only.